British Tornado GR4 aircrafts, currently deployed in Cyprus, have been flying intelligence gathering missions over Iraq for a number of weeks. 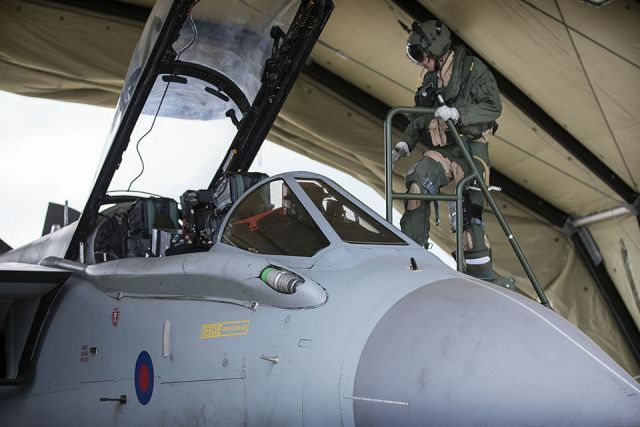 Today, following the British Parliamentary approval given Friday, September 26, in company with other aircraft from the international coalition, two Tornados conducted armed reconnaissance operations over areas of Iraq where the terrorists threaten the civilian population. Although on this occasion no targets were identified as requiring immediate air attack by our aircraft, the intelligence gathered by the Tornados’ highly sophisticated surveillance equipment will be invaluable to the Iraqi authorities and their coalition partners in developing the best possible understanding of ISIL’s disposition and help acquire potential targets for future operations, either by aircraft or Iraqi ground forces. Furthermore, according to the British MOD, "the very presence of coalition airpower over Iraq has a significant impact on ISIL’s efforts to attack the Iraqi people. With no effective defence against air strikes, and knowing the precision with which coalition aircraft can hit them, the terrorists are forced to be much more cautious, keeping their forces dispersed and movement inhibited. They also know that should they concentrate to deliver an attack against Iraqi or Kurdish troops, aircraft are likely to arrive overhead very soon afterwards." The Tornados were supported by an RAF Voyager refuelling tanker. Additionally, RAF transport aircraft have in the past 24 hours delivered further supplies to the Kurdish authorities to aid their efforts in the fight against ISIL.